Cambria Washington: knitwear & patterns: Man, I love colorwork! This, folks, is the Takoma sweater with just about three motifs completed. You can see where I'll be cutting this baby when I finish. I wish I could describe what it is about colorwork that I find so appealing, because I know that many people out there think it's difficult and I'd really like to change that misconception. I love watching a picture grow off my knitting needles. 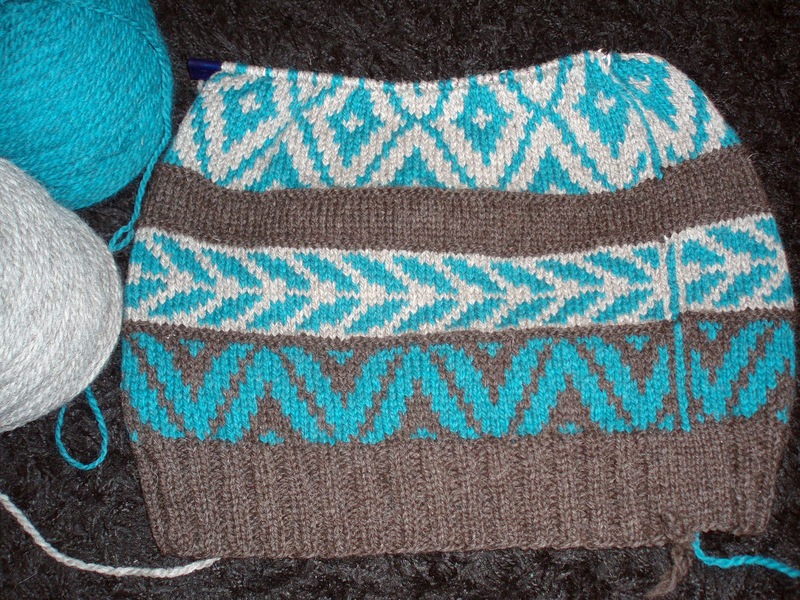 I love how the little squares on the graph exactly match the little stitches on my needles. I always know where I stand with colorwork. You know if there's a mistake because you can easily see it in your work. You can take it a row at a time, and an individual repeat at a time (unless you're me, in which case you have to finish an entire row before you can put it down). You can be surprised by the way some colors play well together despite your expectations, and how others simply don't work out. It's sort of like paint-by-numbers, only with yarn. Don't be afraid to do colorwork. Give it a try. Just two strands of yarn and your needles. Start with something simple like a hat or a mitten or sock, and work your way out. Check out the blog tutorials, the youtube videos, the articles in knitting magazines. Take a class at your LYS (I taught one last week). Just try it! Cut yourself a break, accept that your tension is going to be wonky on the first project, and have fun with the process. You might just surprise yourself and find that you've got a natural talent for it, and next thing you know, you're knitting a fair-isle pullover, lol. Or not, but at least you will have given it a try and not let fear hold you back from attempting something that you've always liked the look of, but thought you didn't have the skill set for. I look at this and think you are so talented. You make it sound easy. It is going to be gorgeous. Hope all is well with you. Stop by the group page, haven't heard from you in a while!